When Die Hard came out in 1988 it came on the heels of an era of action movies like Rambo, Predator, and The Terminator. 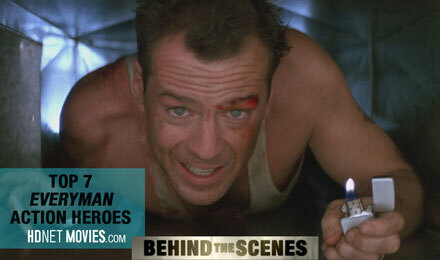 Compared to the action stars that had come before, Die Hard’s John McClane was a new breed of hero. The muscled bodies of Arnold, Sylvester, and Jean Claude were still around but Bruce Willis’ John McClane embodied something new. The quips, the catchphrases, the bloodied brow and trademark undershirt marked a turning point in action cinema. No longer was the genre defined by the body as a machine, as epitomized by the Terminator, rather, Die Hard invigorated an era of action narratives centered on the Everyman Action Hero. The era of Everyman Action Heroes wasn’t merely precipitated by a shift in the kind of movies Hollywood was making. It wasn’t simply that Die Hard broke out as a new formula and a new expectation was set, and what followed was the cyclical nature of Hollywood genres entering into a new phase. Instead, Die Hard represented a larger shift in cultural attitudes that were reflected in one of the dominant genres of the era. Action cinema tends to reflect its era, and action movies are often statements about representations of masculinity. While the early 80s action films were populated by monolithic figures like Arnold Schwarzenegger or Dolph Lundgren, which some movie scholars argue were reactions to Cold War neuroses, the evolution brought about by Die Hard was closely tied to the dominant themes in American political culture of the late 80’s. On the heels of the Vietnam war, with America’s supremacy in question, declines in manufacturing, and the encroachment of feminism, the era of Ronald Reagan’s presidency set about to redefine the perception of America’s strength (and by extension, notions of masculinity), and it did so by focusing inward on the social and cultural conflicts within America’s borders. Strength, virility, paternalism, conservative values, security and supremacy, were the qualities projected by the Reagan presidency, and in turn, Hollywood began to incorporate these same qualities into action hero narratives. The shifting political attitudes, represented in part by the Reagan coalition, cemented a new notion of strength centered on the American workforce: mostly white, socially conservative, blue-collar workers. And maybe that sounds familiar at this point, because that’s Bruce Willis’ John McClane in a nutshell: blue-collar worker, in the body of an average joe, a regular NY cop in the wrong place at the wrong time. Despite his everyman trappings (afraid of flying, never been in a limo, scared when the terrorists take hostages, and just a man trying to fix his failing marriage) he’s forced to step into the hero role. The film even makes light of this deficit between masculine heroes of the past and the everyman nature of McClane, with references to Rambo and John Wayne, with McClane telling Hans Gruber he’s more of a Roy Rogers type. A western star known as much for his singing charms as he was for his westerns. But his vulnerability is no clearer at any point in the film than when he’s barefoot, near tears, broken and in the bathroom picking glass out of his feet, compare this to an image of James Bond, who, after jumping onto a moving train, stands up to adjust his cuff links. 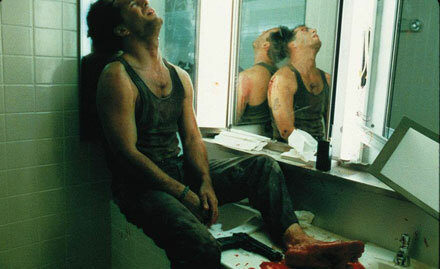 Indeed, the allure of John McClane lies within audiences’ ability to identify with his averageness. McClane is vulnerable, he shows his fears, he wisecracks out of exasperation, he’s a man you believe could lose. But in more ways than one, McClane functioned as stand-in for Reagan-era values: his conservative east coast values appear out of touch in progressive California, seen in his discomfort at the party, including the kiss on the cheek he receives from another man. The setting, in Nakatomi Plaza, signifies Japan at the height of its economic prowess. When the bureaucratic forces like the FBI and the LAPD fail to materialize their strength, it’s McClane rugged individualism that leads him to step up. And to hit the nail on the head, by the film’s end, McClane has saved his wife (and, possibly, his marriage) from the villain’s grasp by unclasping the Rolex given to her by her boss, Nakatomi’s president; once again in John’s arms, an officer refers to Holly by her maiden name, “Gennaro,” which she corrects, calling herself “McClane.” Like that, rugged individualism of an average, everyman, blue-collar hero triumphs. Feminism? Defeated. The feared economic stranglehold from abroad? Defeated. American everyman masculinity is saved. And with that, John McClane became one of the defining action heroes of an era, and initiated a trend towards everyman heroes in action movies going forward. Roger Thornhill – Cary Grant’s Roger Thornhill in North by Northwest may have been the everyman hero before even John McClane epitomized the everyman. 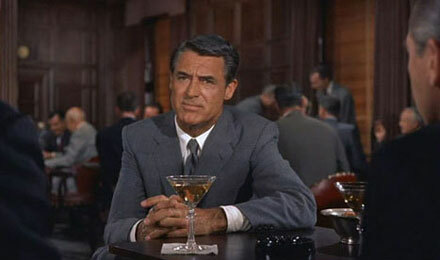 As an ordinary man who suddenly finds himself in a deranged plot of spying, sabotaging, stabbing, and dangling, Cary Grant was one of hundreds of pitch perfect casting choices by the legendary director, Alfred Hitchcock. Despite the star’s fame, his naturalism and charm poured through in the role, allowing easy audience identification. Which also happened to accomplish one of Hitchcock’s premiere suspense techniques: putting the audience in the character’s shoes. 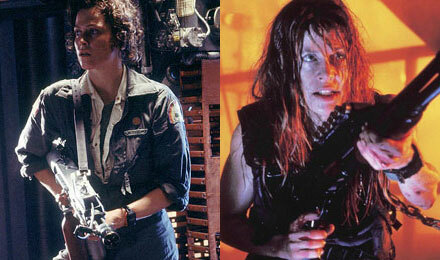 Ripley (Alien) / Sarah Connor (The Terminator) – Bruce Willis’ John McClane operated as a statement about masculinity in the Reagan-era, action films that came a few years earlier offered transgressive approaches to the everyman hero, with everywoman heroines like Sigourney Weaver’s Ripley and Linda Hamilton’s Sarah Connor. Both of these badass ladies are reluctant heroines, not expecting to be saviors but evolving into ultimate badasses nonetheless. Sarah Connor begins as a waitress with no save-the-world training, thrust into action that she could have never imagined. On the other hand, Ellen Ripley begins Alien as a warrant officer, when the rest of the crew is hunted down and killed by an unknown creature, she is the only member to survive and escape, going on to become an ultimate badass (of varying human and clone incarnations). Both these characters transcend typical representations of the action hero by virtue of their femininity, but both are determinedly self-sufficient and opt out of romantic partnerships, yet are still identifiable through traditional conceptions of masculine action heroes. Annie Porter (Speed) – Like John McClane, she’s just a “Wildcat,” in the wrong place at the wrong time. In fact, in many ways, Speed was just a re-hash of the particular Die Hard formula. And while Keanu Reeves’ Jack is supposed to be the everyman, blue-collar hero, it’s Sandra Bullock’s command of the secondary protagonist that stands out in the film. She’s the everywoman who is only stuck riding public transportation because she lost her license, of course, for speeding. When the bus’ driver is accidentally shot, she’s unwillingly put into the role of heroine, taking command of the giant vehicle as they fight the whims of a madman. Sandra Bullock’s Annie is one of the best everyman action heroes in the era of sanitized, rehashed everyman action hero plots, aka Die Hard on a bus with a female protagonist. Nic Cage (in The Rock, Con Air, and Face/Off) – In the late 90’s, Nic Cage dominated some of Hollywood’s biggest action films by simply being the everyman action hero incarnate. With his weirdness and that receding hairline, few would’ve guessed that Nic Cage would become an action star, yet his odd charm was suited perfectly to the everyman. Whether he was just a scientist or just a freshly-released inmate with a bunny trying to get home to his daughter, he became an everyman in wild action scenarios, like saving San Francisco from a chemical weapons attack or defeating a bunch of inmates taking over a convict transport plane, and he always sold it. 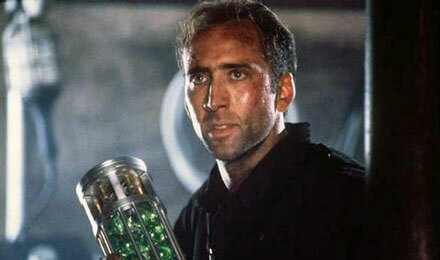 Cage was so good at this role, that in the 90s he was actually Hollywood’s 2nd most bankable star, behind Will Smith. Like Bruce Willis before him, his physique did not determine his action star quality, his charm and wit were far superior weapons. Shaun (Shaun of the Dead) – The everyman’s zombie apocalypse movie, plain and simple. Shaun is a going-nowhere, 29-year-old salesman. He’s disrespected by his younger colleagues and lives with two dudes, one of which is his schlubby, pot-dealing best friend, in a crappy apartment, all while his girlfriend is getting ready to leave him. And then the zombie apocalypse hits, and even while it’s all around him, Shaun continues on with his boring daily life at first. Until he’s suddenly forced to be a hero to his friend, girlfriend, and family, lest he become a zombie to his own dead-end job and the modern life around him. 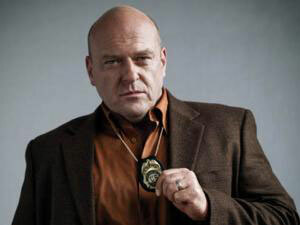 Hank Schrader (Breaking Bad) – Let’s just start with this: DEA agent, who brews his own beer in his garage (with his own face on the labels! ), gets into over-matched shoot-outs and bar fights to which he, with a mix of luck and only a little wisdom, unwittingly wins out. Yet, Hank Schrader also deals with the weight of the trauma inflicted by his job, seeing coworkers die in an explosion, getting shot at, etc. He’s both tough, with a brash, jock persona, and yet, also, extremely vulnerable, confronted with the consequences of his choices, the violence he faces in his work, and his desire to have a normal life, all of which often causes him to breakdown in panic attacks. He’s supposed to be the hero in the hell he’s unknowingly a part of because of his brother-in-law’s meth empire. Don’t miss John McClane’s classic everyman in Die Hard 1, 2, & 3. Now showing on HDNET MOVIES.